All Songs Considered is NPR's guide to discovering new music below the radar. Every week, host Bob Boilen and producer Robin Hilton go through hundreds of new cds to find sneak previews of music that's worth getting excited about, whether it's the latest Swedish pop band, a hip hop artist going ambient, or a singer-songwriter with a twisted new take on love. Sometimes, artists or critics stop by All Songs Considered with their top picks. It?s the perfect show for listeners who want to stay current, but don?t have the time. All Songs Considered started as an online show in 2000 after receiving countless letters from listeners who wanted to know more about the music played between stories on NPR's evening news program, All Things Considered. Now All Songs Considered has become a destination for artists such as Lily Allen or Bright Eyes to spin their favorite tunes, or musicians such as Wilco, Bjork Sigur Ros or Ben Gibbard webcast their live concerts. It is a show that one week can feature the music of Portugal and the next feature the White Stripes or Andrew Bird. All Songs Considered has a dedicated and growing online audience: Hundreds of thousands listen to All Songs Considered on the web and via podcast every month and the All Songs podcast is consistently ranked the #1 music podcast in iTunes. 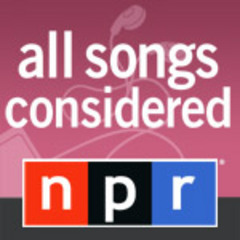 You can visit All Songs Considered online at http://www.npr.org/programs/asc/. Host Bob Boilen went to CMJ and all he got were some great music picks. Bjork spins an eclectic mix of songs for host Bob Boilen. Bob Boilen shares new music from Moby, ApSci, The Phenomenal Handclap Band, plus a prime cut from Neil Young's massive new box set. Host Bob Boilen spins new music from The Low Anthem, The Dry Spells, Diana Jones, Zee Avi and more. Are you a lyrics person? We ask that question and listen to new CDs by Wilco, Loxsly and more. For host Bob Boilen, everything about the new Green Day is just right. So why doesn't he like it? All Songs Considered listeners tell host Bob Boilen about their favorite bands. New music from Patrick Watson, MGMT's musical soulmate Sucker, Art Brut and more.